I don’t know about you, but I do love seasonal decor. I’m not saying I go all out for every holiday, but I do like to see some transition in color in my home and on my table as the seasons come and go. However, it can be hard to decorate – or should I say, spend money on decor – when a holiday season is short lived (think Halloween). So I’ve come up with a solution to this dilemma: focus on color. 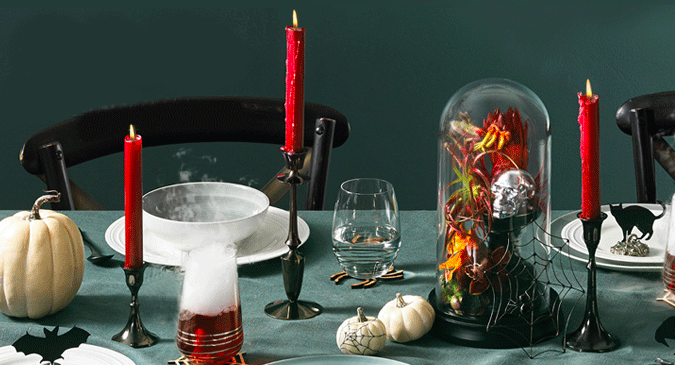 Let’s look at transitioning your tablescape from Halloween to Fall, for example. Instead of spending the bulk of your decor budget on Halloween specific tablecloths, table runners and dishes, focus on the colors of the season, namely orange and black. That way, you can still use the orange as you transition your table to a generic fall theme or even a more specific Thanksgiving theme. If you want to personalize for the specific holiday, consider free printables in the shape of bats or black cats to use as placeholders or candles set at different heights in different colors running through the center of your table. As you continue to think about Fall decor, you can even bring in things from outside your home or your yard, such as decorative branches or dried, colorful leaves. Placemats and table linens are just one way to make your tablescape reflect the holiday. Chances are, you’re going to have some kids at your table as well, so why not consider letting them join in on the decorating fun. Another simple way to personalize your table that’s great for halloween is with a chalkboard paper table runner. Not only is it black, but it let’s kids decorate it exactly the way they want. Looking for more ways to transition your holiday decor? I’m not trying to get ahead of myself, but check out my post on Making Your Home Merry for budget-friendly tips for transitioning to Christmas decor.